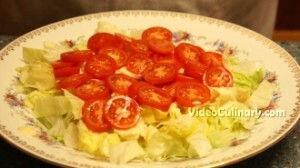 Try this quick and easy fresh vegetable & lettuce salad, dressed with a creamy thousand island dressing. 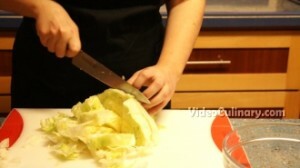 Wash and roughly chop about 300 grams (10 oz) of lettuce. 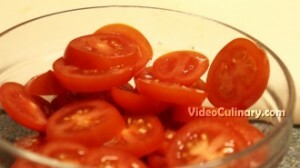 Slice about 200 grams (7 oz) of cherry tomatoes. Cut about 200 grams (7 oz) of bell pepper into strips. Cut 150 grams (5 oz) of cucumber into slices. 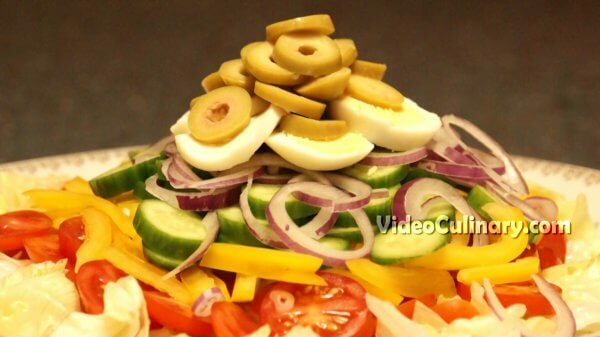 Thinly slice 40 grams (1.5 oz) of red onion, 4 olives and one hard-boiled egg into rings. 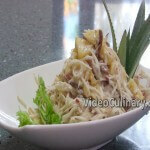 Arrange the lettuce on the plate and drizzle with some of the Thousand Island Dressing. 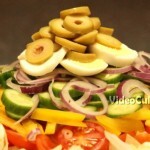 Continue arranging layers of vegetables, pouring some of the sauce over each layer. 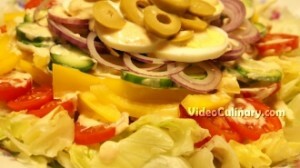 Serve this delicious, fresh vegetable salad with homemade garlic croutons!